Elevate camping food to a new level by cooking chicken breasts wrapped in aluminum foil on your home grill. The foil not only reduces the mess, but it also accelerates cooking time and keeps the chicken tender by sealing in moisture. Add a few seasonings and some vegetables for a complete meal in a packet. Preheat the grill to medium-high heat. Prepare two sheets of aluminum foil measuring 18 inches by 24 inches. Place the sheets together for durability. Place one thawed, boneless chicken breast on each stacked pair of foil sheets, positioning the chicken to one side of the foil. Season the chicken breasts well with any desired seasonings, such as salt, pepper, garlic powder, lemon pepper or mesquite seasoning. Add vegetables, such as carrots, onion, summer squash or peppers, or a savory sauce, if you like. Fold the other side of the sheet of foil over the chicken to create a pocket. Fold the outside edges over two or three times to make a tight seal. Place the foil packets on the preheated grill rack and cook for 15 to 20 minutes, turning once. Remove the packets from the grill and carefully insert a meat thermometer through the packets and into the chicken breasts. The chicken is done when the thermometer reads 165 F. Allow the chicken to rest for five minutes before slicing it. Boneless chicken breasts work best for this method of cooking, but if you use bone-in breasts increase the cooking time to 30 minutes. 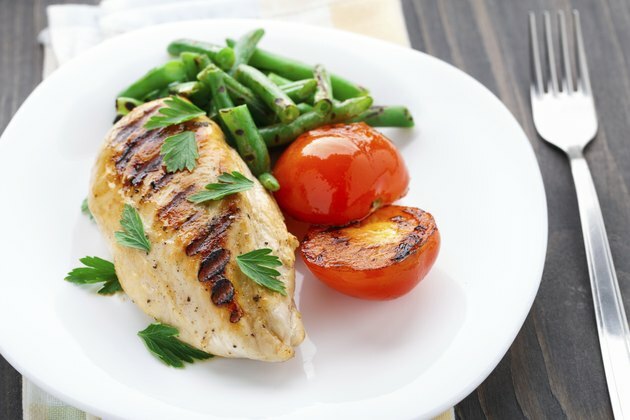 Chicken breasts wrapped in foil won't brown or become crisp on the grill. For a golden crust, grill the breasts unwrapped for four to eight minutes before wrapping them in foil. Simplify clean-up even further by eating the food directly from the packet. Make a large slit down the front of the packet to open it and dinner is served.